It's about damn time. 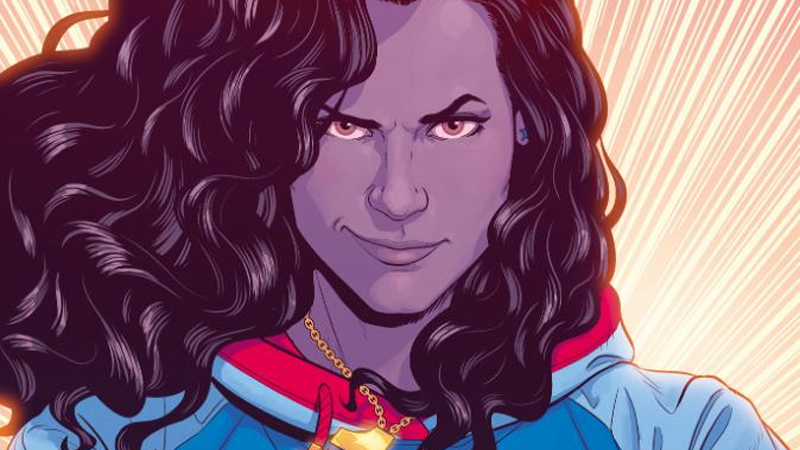 Fans of Marvel's updated take on the Miss America concept have wanted a series starring America Chavez for years — and it took them so long that her original creators went off and created a new version of her at Image Comics. But thankfully, finally, Marvel are getting with the program. Announced at New York Comic Con, there are no details yet on America, other than a cover for the first issue drawn by artist Jamie McKelvie, who, alongside Kieron Gillen, helped propel America to popularity in the 2013 Young Avengers series. No other pieces of the creative team were revealed, and neither was a release date. America is an important announcement from Marvel Comics, not just because of the fact fans of America Chavez have been waiting for her to get a series for so long, but also because America marks the first series in Marvel's upcoming roster of new comics to star an LGBT lead. It's been a bad year for LGBT character representation for Marvel, with the end of Angela: Queen of Hel earlier this year and heavy criticism for their erasure of demigod Hercules' bisexuality, as well as a general lack of prominently visible LGBT characters in either its comics or movies. While their rival publishers have made leaps and bounds in the representation of LGBT lead characters and outreach to the LGBT community, Marvel has instead stayed silent, leaving its LGBT characters to supporting or minor roles in other series. America represents a step in the right direction, but it's just a start. Angela was cancelled due to the writer using it as a platform to spout feminist lies and man hating propaganda in a horrible form, worse than The Mighty Thor. If America does the same, then it'll go the same route as Angela. Don't make America another ultra-feminist man hater comic and it might actually do well. If Marvel can use this new character correctly and not make her sexual orientation the central core of her character, then I hope the book does amazingly well. We do need more LBGT characters in fiction, and they have to be done right. This is Marvels first big chance and I'd hate to see them screw it up. people should do what makes them happy, but i hate LBGT for sake of LBGT - Zulu in the Star Trek film as homage to Takei, its changing an established character for the sake of appeasing external forces. similarly i was against the ending re-write for mass effect 3 because creators need to have loyalty to their subject or its integrity is damaged and consumers will stop caring as the creators have..